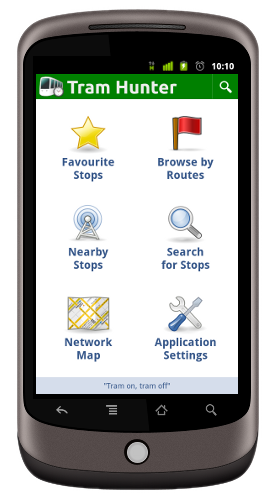 Tram Hunter is an Open Source application for the tramTRACKER® web service provided by Yarra Trams. For details, try the About or Screenshots pages for a feel of what the application can do. If you're interested in looking at the code, or contributing to the application, see the Source page for details on accessing the source code and license. If you'd like to file a bug or have a feature request, head over to our Github project site or join the Tram Hunter Google Group and email us at tramhunter@andybotting.com. You can also follow the latest news by our Twitter feed.